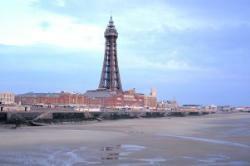 Looming over Blackpool’s Golden Mile, the Tower has to be the most famous seaside landmark in England. There's entertainment for all ages, night and day at the world famous Blackpool Tower and Circus. Don't miss the Tower Circus, voted "UK's Best" for the third consecutive year, the Magnificent Tower Ballroom, Jungle Jim's Adventure Playground and of course, the Tower Top Ride and Walk of Faith. There's something for everyone at Pleasure Beach, Blackpool. There are over 125 rides and attractions, plus spectacular shows. There's everything from thrilling white-kuckle rides - the Pepsi Max Big One, Grand National and our latest rollercoaster: Infusion - to leisurely cruises around the River Caves and Alice's Wonderland. For the kids - Beaver Creek Theme Park, home to Bradley Beaver and his very own Log Flume amongst many other child friendly rides. The three star-studded piers along Blackpool's famous Golden Mile not only offer countless hours of thrills, spills and laughter for thousands of visitors a year - they are also venerable institutions of Britain's seaside history, and have watched as the town evolved from the sawdust and oyster bars of yesteryear to the slick roller coasters and night clubs of today. 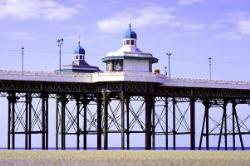 Each pier has its own distinct identity, and with a combined length of over a kilometre, holiday makers can happily spend several days exploring all they have to offer. Set amid 32 acres of maturing parkland and lakes, the award winning Blackpool Zoo is home to over 1500 beautiful, rare and exotic animals from all around the world. 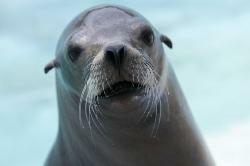 With elephants, lions, otters, zebras, sea lions, tigers, kangaroos, many types of monkeys, plus all your animal favourites. With play areas, crafts, miniature railway, shops, picnic areas, it's an excellent value family day out. The greatest free show on earth has been part of British life since 1879 and continues to be an electrifying experience for millions of visitors. 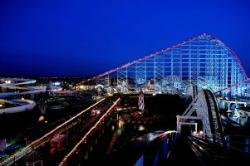 As the summer season draws to a close, Blackpool looks forward to long autumn nights bathed in light and colour. The brightest night of all in Blackpool is the Big Switch On, when thousands of people gather to enjoy the fun and excitement. On this and every other night of the season, Blackpool’s Illuminations retain the magic and excitement every visitor experiences on their first trip through the ‘Lights’. The styles and technology, however, are constantly adapting to address the green issues of conservation and energy efficiency. Top firework companies from around the globe will be invited to stage pyrotechnical displays, bringing an International flavour to Central Promenade during the opening weeks of Blackpool’s World Famous Illuminations season. To out-shine their opponents, entrants must demonstrate cutting edge pyro-musical design with a display that represents the style or traditions of their country. Each competing company will launch fireworks particular to their homeland and showcase their own pyrotechnical expertise, to win the public vote. 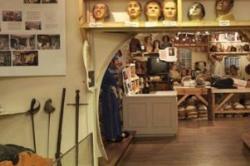 Louis Tussaud's Waxworks is the place to be to mingle with the stars and is open daily from 10am. Walk down the red carpet and be immersed into the world of celebrities from Hollywood's "A" List to the tabloids favourites in "Celeb City". Visit the Rock factory where you can see Robbie Williams and Madonna and dare to venture into the Chamber of Horrors with its gruesome collection of monsters, ghouls and fiends. Louis Tussaud's is where the stars are made. There’s a wide variety of High Street names and independent shops offering variety and quality. The shining new Houndshill Shopping Centre in the centre of the resort offers all the big retailers under one roof, from H&M to Debenhams, Primark and Next. The interesting boutiques and speciality shops found dotted around the town centre offer designer labels, high-class jewellery and art. Explore the local markets with their stalls piled high with tempting food from across the region. And St John’s Square – a vibrant piazza with cafes and markets – is set to be unveiled in September 2009, making shopping in Blackpool even more of an experience. 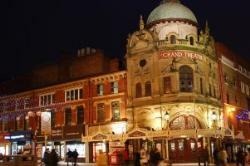 The Grand Theatre, Blackpool is a beautiful 1,080-seat Victorian theatre which was designed by renowned architect Frank Matcham in 1894. This amazing space now offers visitors a packed year- round programme of live theatre from opera, ballet, plays, comedies, musicals, contemporary drama and dance to fun children’s shows and of course pantomime! The country’s largest theatre, with a seating capacity of almost 3000, the Opera House is a famous venue. It has seen performances from the world’s greatest entertainers and shows, ever since it opened in 1939. 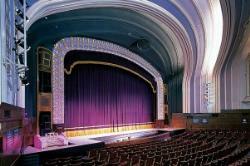 Hollywood stars such as Frank Sinatra, Judy Garland and Bob Hope have all graced the Opera House stage. More recently, stars including Shirley Bassey, Tom Jones, Ronan Keating, Jim Davidson and Peter Kay have performed to sell-out audiences here. Shows have included top west end productions such as ‘Joseph’, ‘Grease’ and ‘Cats’. 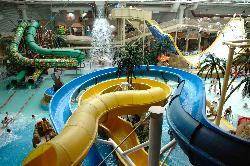 Sandcastle Waterpark, Blackpool is the UK’s Largest Indoor Waterpark and with 18 slides and attractions it is easy to see why Sandcastle Waterpark continues to make a splash. In the 84o tropical climate there is truly something to entertain the whole family. Whether it’s the thrill of the slides like Masterblaster – the Longest Indoor Rollercoaster Waterslide in the World and Sidewinder – the World’s 1st Indoor Vertical Waterslide or the more relaxing free flowing Ushi Gushi Action River, the tranquil Shimmering Shallows and the ever popular Typhoon Lagoon Wavepool.